In addition to being full members of the British Association of Removers (B.A.R.) 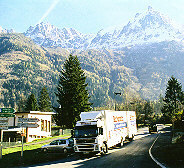 Britannia Devereux are members of the European Moving Group (E.M.G.) and Fedemac. These organisations represent European movers collectively operating thoughout Europe with a vehicle fleet of over 1500 vehicles, employing over 8,000 staff. For over twenty five years Britannia has moved household and personal effects for thousands of customers to every destination in Europe. Each and every situation and problem Britannia have experienced has built an invaluable local knowledge throughout Europe. As a result, Britannia emphasise the necessity to assess the delivery/collection access, bearing in mind the size of our European vehicles used. However, Britannia do not feel that you should worry too much regarding this. Whether the access road is narrow, the stairway is inaccessible, your property is secluded in a rural setting, with prior knowledge Britannia will endeavour solve the problem. This information can be critical to ensure your move goes smoothly. So that Britannia's services are right for you every time, Britannia make sure that all their staff receive the highest level of removals training from our two dedicated training centres. Packing for a European move is a specialist skill and Britannia have experienced and professionally trained staff to provide this service for you. Using a modern range of environmentally friendly purpose made packing materials Britannia's staff will arrive punctually at your home to prepare your possessions for collection. Detailed inventories are prepared for the onward move to destination or storage. Such qualification and membership status gives you confidence that you are dealing with the Uk's market leaders in European moving. Most computers have Adobe Reader as standard, if not download it from the link below.